A powder beard in May? My trip to Alaska let me know my knee was ok and got me pumped for the rest of the season. The only problem was that it had not been snowing much in Colorado and last year there was no snow after mid March so there were lots of fears that 2013 would be a repeat. However, if there’s one thing we know for sure, it’s that nobody knows what mother nature will do. This year in Colorado, she decided to play a mean trick and wait till most resorts closed before turning on the snow spigot. The biggest snow cycle of the year started the day after Vail shut down for the season and continued till they reopened a week later – the first time they’ve done that in 26 years. 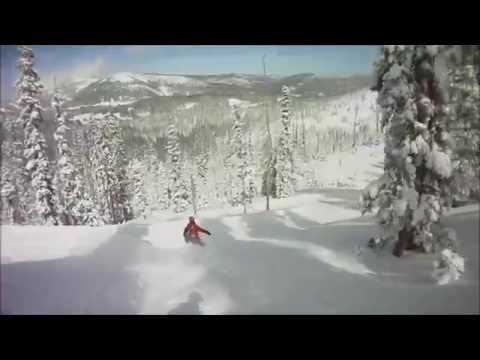 I was lucky enough to catch the reopening which was quite spectacular and like all good days at Vail, very well attended as you can see from the photo below. For those who can’t bear for the season to end both Loveland and A-Basin stay open till at least May and tend to do well in spring storms. This year has proven to be a stellar example as Loveland has received over 100 inches since April 1st – no fooling! I was fortunate to catch three days during that stretch – all of which were at least a foot with the last on May 2 being a 17″ in 24/24″ in 48 extravaganza. I was too busy snarfing powder to take many pictures but did record the clip below for authentication purposes. While I had a great summer and a beautiful fall, when the snow starts flying in town my mind turns to winter with its’ many delights. Some years the gods can be cruel and make us snow obsessed folks wait till winter officially starts before delivering natures precious white fluffiness. Fortunately this is not one of those years – at least not at my favorite family owned ski hill better known as Wolf Creek. 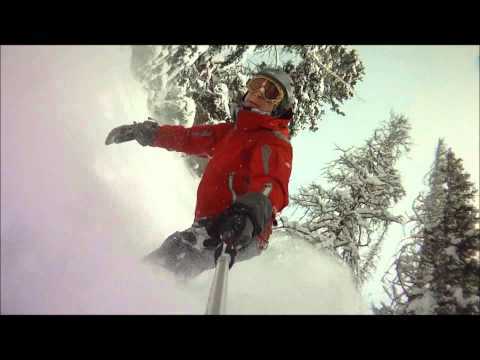 For two year’s now I’ve been trying to convince Joel Gratz, the man behind OpenSnow (formerly known as Colorado Powder Forecast) that he really needed to check out the mountain that consistently gets the most snow in Colorado. But being a full time meteorologist/web site developer/business owner doesn’t leave a lot of time for long road trips so the timing had to be just right to make it happen. Thankfully, weather and work finally aligned properly and I had the pleasure of having my own personal forecaster for a classic Wolf weekend. I’ll let Joel’s video report tell the story of day one. Day two promised more of the same. While Saturday definitely featured some early season conditions by Sunday we were in full winter mode. The ski patrol at Wolf is all about customer service so in no time at all they had all the ridgelines open for our hiking pleasure. The best terrain at Wolf can only be reached by hiking which often makes the mountain feel more like lift accessed backcountry than a traditional ski hill. I personally don’t mind having to earn my turns – if nothing else it helps the endorphins kick in earlier. I tried my best to give Joel the full tour but a patrol induced slide knocked Horseshoe Bowl out of contention. So we had to settle for just ripping up the lovely glades that are everywhere on the mountain. We shot a ton of video, but like most helmet cam footage it’s only really worth watching if you experienced it the first time. Suffice to say, it was well worth the effort. The picture above says it all for me. I’m headed into a nice steep pitch in dynamic terrain filled with pristine snow – I couldn’t really have asked for anything for more especially considering it was November 6th! But in fact it wasn’ t that surprising as this was far from the first time that I had the pleasure of bountiful early season freshies at the Wolf and hopefully won’t be the last. When I was up in Alaska, everyone kept telling me that I would now be ruined for skiing anywhere else. But for me the exact opposite seems to be true because as with any true addiction, a good dose just makes me want more. Fortunately for me, this April in Colorado has been stellar and provided me with numerous opportunities to get fresh fixes. 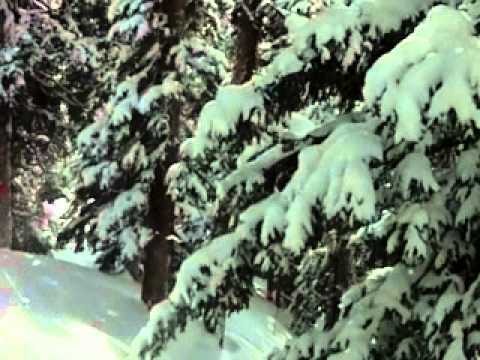 Yesterday it was Loveland’s turn to deliver the goods – when the morning report said 8″ overnight and snowing hard (16″ by lunchtime) I called everyone on my list but no takers so was forced to shoot the following video of myself just to prove how good it actually was. It’s been a tough season for Wolf Creek. Their ski patrol director died in an avalanche back in November and seemingly in remorse the snow gods have been withholding their usual bounty from the area. Although I did not know him personally, I’m sure I had met him because I’ve always made it a point to thank the patrollers there for the incredible effort they put in keeping open the entire area for what is often only a few people. This includes extensive hike to terrain where my friend Kevin and I spent most of our weekend enjoying turn after turn of deep untracked snow despite the presence of several thousand Texans who were enjoying the President’s Day Weekend. If you’ve followed my blog at all you know that Wolf Creek has a special place in my heart. I have had more epic days there than anywhere else but more than that it’s just got a relaxed vibe that you can’t find at the major ski areas. The lifts may be slow and the runs short but few other places can deliver the powder as consistently as the Wolf. This weekend was no exception but the irony was that the supposed bigger snow day (Sunday – 14″ new) was just a tease for Monday (a supposed 6″ in 24 but more realistically overnight) when the sun came out and the crowds went home. 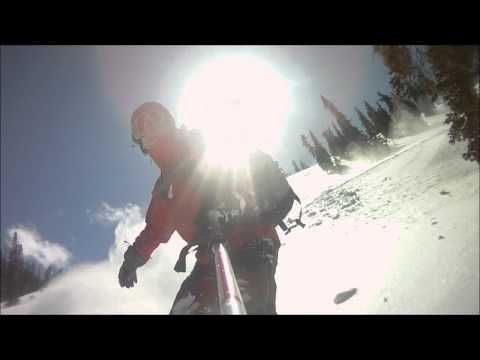 We worked hard for our turns but boy were we rewarded as the video below can testify. So once again we left the mountain shaking our heads at how good the skiing and riding was and how lucky we were to be there. Long live the Wolf! Any skier who has spent a winter in the Denver/Boulder area is almost certain to have has an I-70 horror story. For a front range skier there’s no escaping the terrain trap that is the main thoroughfare through the mountains. When I woke up Tuesday morning to find out that Vail had called 16″ and Breckenridge 26″ (roll eyes here) my first thought as always was “time to get moving”. My second unfortunately was “better check on I-70” and sure enough it was closed. I had planned to go to Vail with everyone’s favorite forecaster Joel Gratz who immediately suggested we leave right away and take 285 to get around the closure but this had the potential of breaking my hard and fast rule that I must spend more time on the hill then in the car on any given ski day. Since only a relatively small portion of the road was closed (Georgetown to Silverthorne) we decided to take a chance and head up hoping the road would open by the time we got there. No such luck however, so we sat in the car for two hours searching the web in a futile attempt to get some info all the while being greatly entertained by the CDOT phone road report which told us that the road was closed so we “should plan accordingly” without giving us any indication of why it was closed or when by chance it might reopen. Just as we were about to give up and head home the road reopened and now our only option for first tracks was Loveland. We certainly weren’t the only ones whose plans had changed to Loveland but news of the road closure had discouraged a lot of folks so while they were quite a few powder hounds out, there was plenty to go around. Loveland had also called 16″ but with the high winds the day before (a 100 mph gust was recorded the previous morning) I assumed the snow would either be in Kansas or heavily wind packed so was very pleasantly surprised to find a legitimate foot plus of high quality Colorado snow. 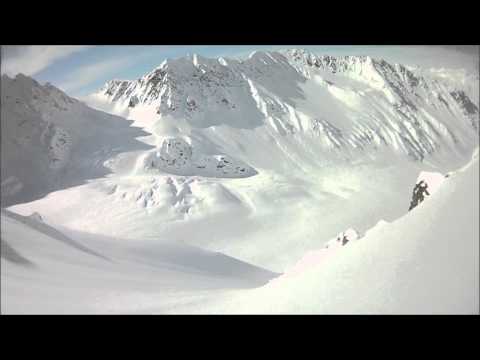 In the last year, Loveland has opened almost the entire East Wall you see above the tunnel which has steeps, cliffs and lovely glades so we spent most of the day there getting fresh tracks and face shots as evidenced by the video below.